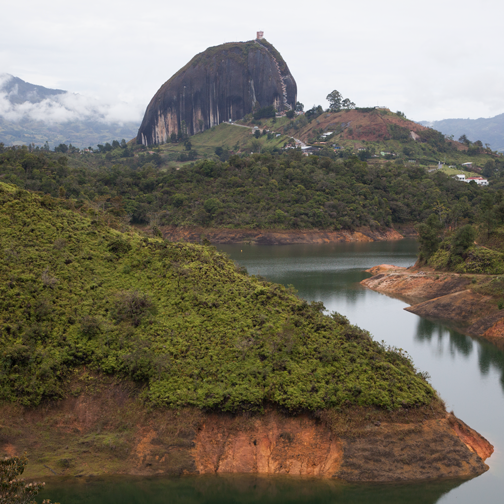 The route between Manizales and Medellín winds heavily along rivers and mountain ridges. 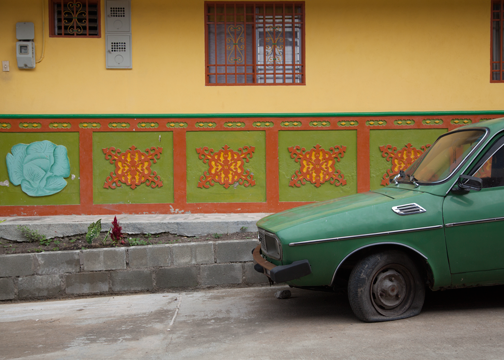 Despite the narrow shoulder, houses, restaurants, and truck stops cling to the entire route. It is a beautiful drive, but not one you are able to appreciate if you prone to suffer from carsickness. 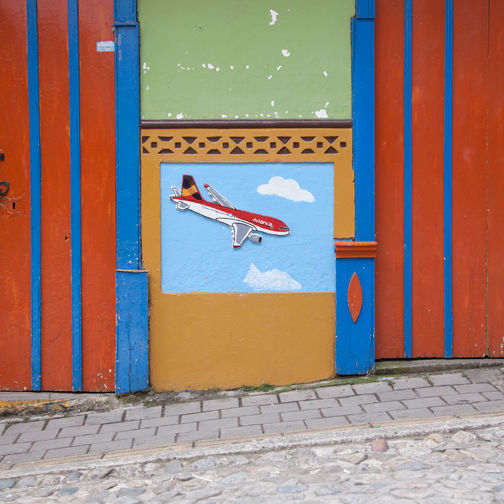 At the South Terminal in Medellín we caught a taxi to the North Terminal and from there we caught a bus to Guatapé. In front of us was a small group of tourists from Britain. All three were dutifully planning their next move in their travel notebooks, but they had absolutely no idea when they needed to get off the bus. Their heads poked up like gophers anytime traffic slowed. 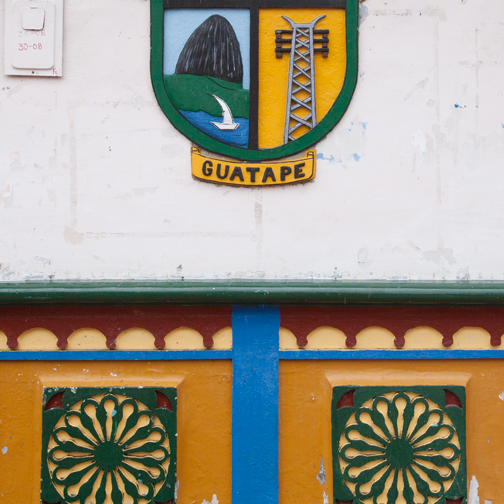 The bus station in Guatapé was right along the malecón. With the exception of the zipline, the land along the waterfront was undeveloped. Dirt footpaths led from the sidewalk down to the boat docks, which made a killing during their sunset outings. We bought some sausages from one of the numerous food carts and walked to the end of town and across a bridge to our hostel. We had learned from out last excursion that it is important to have a reservation during a three-day weekend. The only problem, we soon discovered, was that our reservation was one of the multiple overbookings at the hostel. 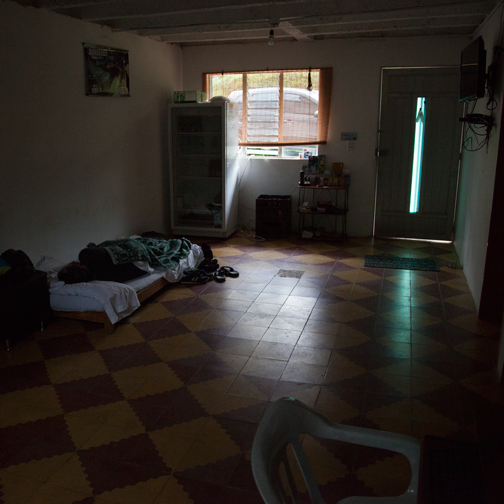 Knowing there would be nothing else available in town, the owner offered us a mattress in the reception area. “And how much will that cost?” I crankily asked. “Free!” He replied. “Qué pena.” How embarrassing. Barret tossed off the sheets and unlocked the door. Our bed received a few curious glances, but then the next thing Barret knew he was helping people tally their beer from the fridge at the foot of our bed. The long journey was worth it though. The following morning, once the rain stopped, Barret and I went into town for breakfast. Not many people were awake, so we had the streets to ourselves and a soft morning light for taking photos. 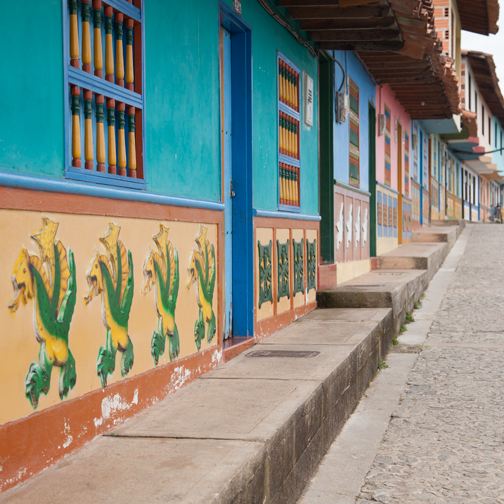 Guatapé is famous for its zócalos, the decorative boards the skirt all of the buildings. 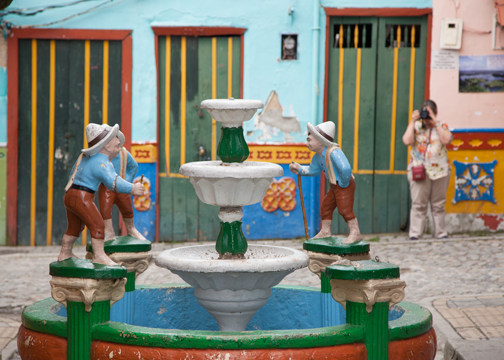 While the origin of zócalos is Spanish, the people of Guatapé have made them uniquely Colombian. The images cover a range of topics from local political events to traditional clothing and food. 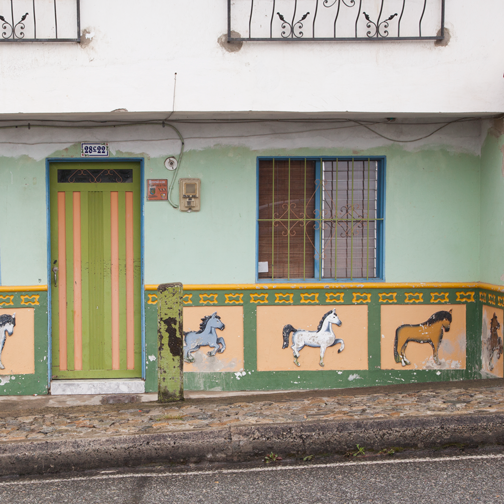 Even the buildings on the outskirts of town were decorated. 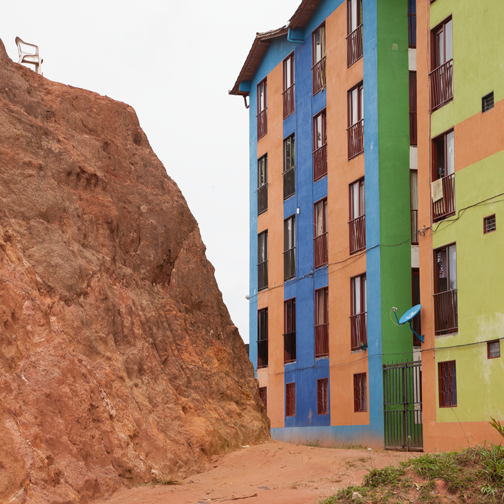 If not with zócalos, then at least with bright colors. 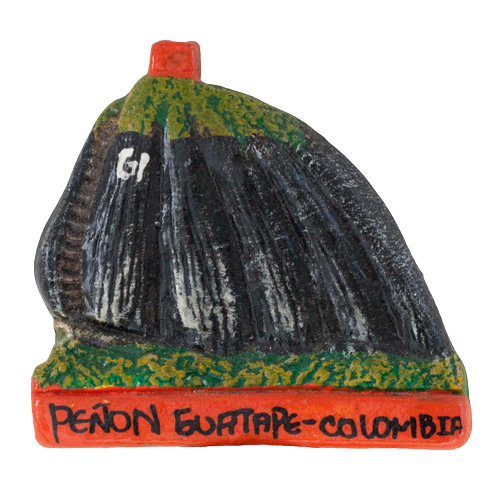 After eating, Barret and I headed to El Peñol (aka Peñon de Guatapé). 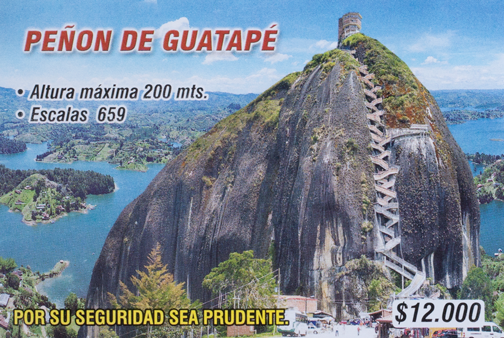 It is a massive, 200 meter high rock that towers over a landscape of man-made lakes and is also the most popular tourist destination in the area. 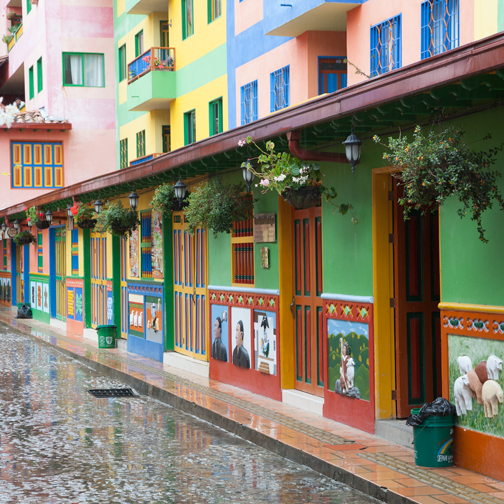 While Guatapé had been quiet, El Peñol was a thriving mass of day trippers from Medellín. 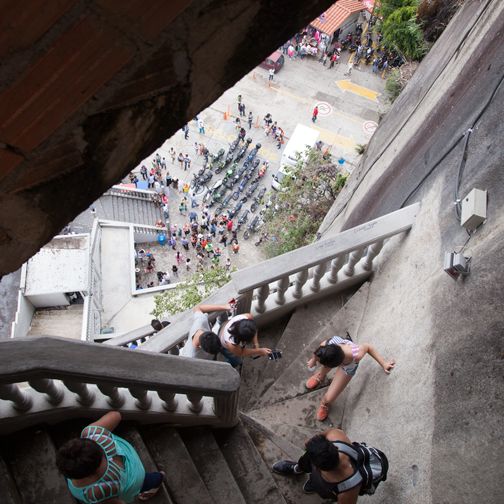 It did not detract from the experience, but it did make the climb up the zigzagging stairs feel like rush hour traffic. There are a few things I feel like I can always count on in Colombia. The first is an abundance of religious trinkets and the second is a plethora of food stalls. On the summit of El Peñol I had a cup of salpicón (fruit cocktail) while Barret drank a Colombian michelada- beer with lime juice and a salt-rimmed glass. Together we shared sliced green mangoes covered in lime and salt. 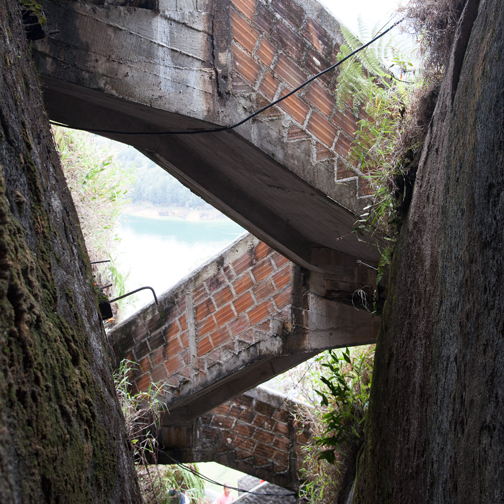 The steep ascent made us appreciate our refreshments all the more because we knew everything was carried up by hand. The mango we were eating had beaten us to the top by about 20 minutes. Returning to Guatapé the cost for the tuk tuk (mototaxi) doubled, so Barret and I decided to walk the overgrown footpath back into town. Once we arrived we continued through the backstreets, which were just as decorated as the center of town, and out into the country on the way to a Benedictine monastery. The road was very quiet and the country views were peaceful. Had it not been late in the day, we would have continued all the way to the monastery. However, our feet were tired, so we turned back for dinner. 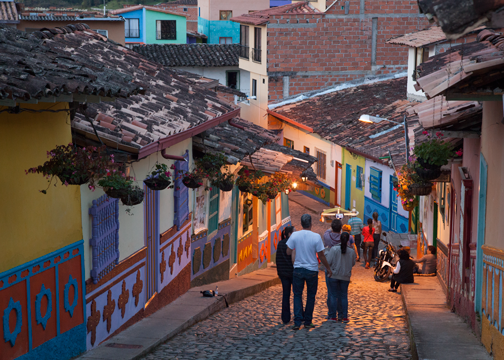 The streetlights flashed on in the evening and warmed the cobblestone streets of Guatapé. Barret and I ended the night at a restaurant called D’Luigi. We sat in the back courtyard, which was filled with the scent of homemade pizza, and sipped a sweet version of mulled wine. The evening was perfect and the best part was that we had a proper hostel room to go back to. 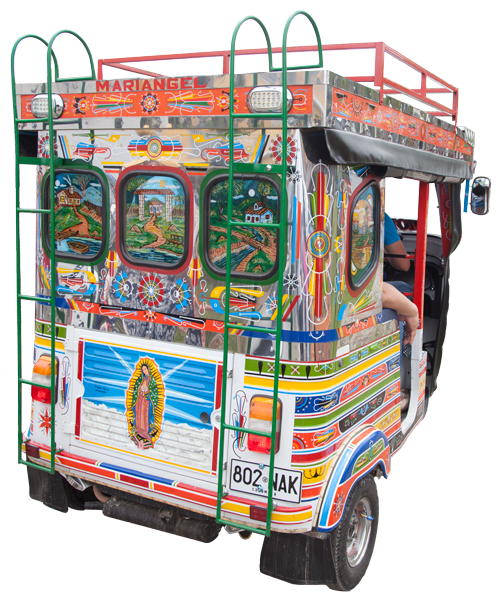 How to get to El Peñol: From Guatapé it is a 15 minute tuk tuk ride or a 45 minute walk. 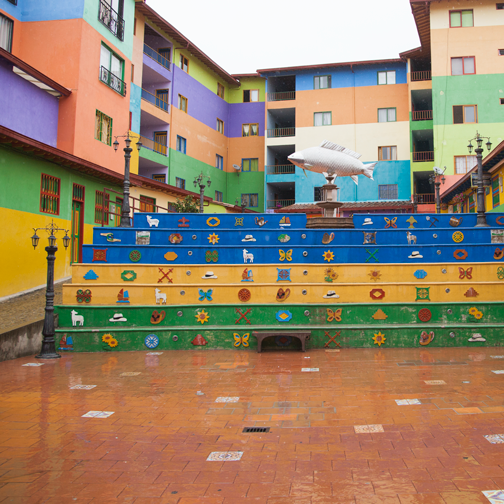 How to get to Guatapé: Hourly buses run from the North Terminal in Medellín.